I don’t think I have seen this expressed as clearly as in that sentence. The “citizenship penalty” deserves consideration. Both US citizens abroad and non-resident aliens are non-residents of the U.S. The fact that the U.S. citizen pays higher taxes, because of U.S. citizenship, is arguably a violation of the “equal protection” clause of the 14th amendment. Furthermore, the U.S. Supreme Court has ruled that “citizenship classifications” are “suspect classifications” and that they can be upheld only if the government can demonstrate a compelling state interest. Why should US citizens abroad pay a penalty because of their citizenship? 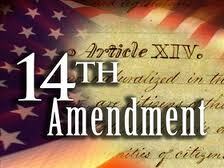 The 14th amendment of the U.S. constitution requires “equal protection of the laws“. What does this mean? Although “equal protection” is conceptually difficult, it does require that people who are similar in terms of the purpose of a law should be treated in similar ways. The seminal article in this area was “Equal Protection of the Laws” by Tussbrook and Tenroek. The idea is that laws must not discriminate against those who who are “similarly situated with respect to the purpose of the law”. This is easier said than done. Laws by their very nature impose obligations or give benefits to different groups. In some cases it makes sense to treat different groups differently. In some cases it makes sense to treat different groups the same. When is it permissible to treat groups differently? Example of Treating Different Groups Differently: For example, for the purposes of receiving benefits from the State of New York, it is reasonable to treat residents of New York as being different from non-residents of New York. Why? Presumably New York benefits are paid from taxes collected by residents of New York state. Hence, for the purposes of the “law of receiving New York benefits”, it makes sense to treat New York residents and non-residents differently. In this case residency is relevant to the purpose of giving benefits. Example of Treating Different Groups The Same: It doesn’t follow that New York residents and non-residents should always be treated differently. For example a law that imposes a speed limit of 60 mph in New York State should apply equally to anybody who is driving on the road. In this case, the fact of New York residency is irrelevant. Both residents and non-residents are the same in terms of the purpose of the law (traffic safety). The question is: to whom should U.S. citizens abroad be compared to for the purposes of possible taxation? The Schneider comment identifies at least two possibilities. Each possibility results in discrimination against U.S. citizens abroad. Possibility 1- Comparison to U.S. Residents – When compared to U.S. residents U.S. citizens abroad are discriminated against because of their residency. Why should only U.S. citizens abroad be subject to so much reporting and paper work? Possibility 2 – Comparison to non-resident aliens – When compared to non-U.S. residents aliens, U.S. citizens abroad are discriminated against because of their citizenship. Why should U.S. citizens have to pay higher taxes simply because they are citizens? Which is the better and more rational comparison? Should U.S. citizens abroad be compared to “Homelanders” or to “Non-resident aliens”? (Note that U.S. citizens abroad are discriminated against under either scenario. It’s just that in the first case (compared to Homelanders) they are discriminated against based on residence. In the second case they are discriminated against based on citizenship. The “proper comparison” depends on the purpose of the law. There are two government objectives in imposing taxes. First Objective – To inflict punishment and to deter behavior. In this case the purpose is to inflict harm. Presumably the intended benefit is that the government will have less of the objectionable behavior. A surprisingly large number of U.S. INCOME tax laws and regulations exist only to inflict pain, punish and deter behavior. In fact, some provisions of the Internal Revenue Code are so punitive that they cease to be “taxation” and become “confiscation”. The PFIC rules would be an example of this principle. Similarly, the fines levied for failing to report information are clearly not taxes but are a form of confiscation. – Subpart F Income (again the fact that this is taxed as ordinary income, regardless of its true nature is proof that it is a punishment tax). The amount of revenue raised from any of these examples is insignificant. Interestingly the PFIC “fine” and Subpart F “fine” apply disproportionately to U.S. citizens abroad. Is that discrimination? The PFIC and Subpart F fines apply to both Homelanders and to U.S. citizens abroad. How could a law that applies to everybody be discriminatory? The answer is that: The law in its majesty prohibits both the rich and the poor from sleeping on the part bench. Second Objective – Taxation exists to finance government services. In this case the beneficiaries are the recipients of those services. The income tax generally applied (for example to employment income) and sales tax generally applied are the obvious examples. The U.S. government generates most the money to pay for services from the income tax generally applied. What is the purpose of taxing the foreign income of U.S. persons who reside in other countries? – What is the purpose of the law? The purpose of levying tax on the foreign income of U.S. citizens who do not reside in the U.S. is unclear. The fact that it inflicts severe punishment on U.S. citizens abroad is very clear. The pain and punishment of U.S. extra-territorial taxation has been well documented in submissions to the Ways and Means Committee. Furthermore, if the results of the following poll are any indication, many believe that the purpose of taxing U.S. citizens abroad is to inflict punish! What is it about living outside the United States that would make them so despicable? What is it that makes them so deserving of harsh treatment? Why is the United States so cruel to its citizens abroad? Are U.S. citizens abroad the property of the United States? Property they can do what they want with? Previous posts have demonstrated that the U.S. government does NOT by its very nature benefit U.S. citizens abroad. In fact as the huge rise in renunciations of U.S. citizenship indicate, people are renouncing to protect themselves from the U.S. government. Furthermore, the “tribute” paid to the U.S. by U.S. citizens abroad, is at the expense of the country where they reside. Hence, U.S. extra-territorial taxation directly harms the economies of other nations. The harm resulting to other countries may mean that, citizenship-based taxation may be in violation of international law. That said: if the purpose of citizenship-based taxation is to inflict punishment on U.S. citizens abroad, then the U.S. citizens abroad should be compare to “Homelanders”. It’s the U.S. citizens abroad who should be punished for leaving the Homeland. Presumably a law with a discriminatory purpose would violate “equal protection”. Should U.S. citizens abroad be compared to Homelanders or to other non-residents who are required to pay tax to the U.S. based on U.S. income or property. The simple fact is that U.S. citizens abroad do NOT use U.S. government services. Furthermore, the idea that the U.S. government inherently benefits U.S. citizens abroad is ridiculous. In fact the U.S. government is very harmful to U.S. citizens abroad. U.S. citizens abroad are like other non-U.S. residents who do NOT use government services. Therefore, with respect to the purpose of raising funds for government services, the correct comparison should be to compare U.S. citizens abroad to non-resident aliens. This is the position taken by Bernard Schneider. The Tax and Benefit Analysis – Who pays and who receives? When we consider the circumstances of citizenship and residence we have four possibilities. What does this mean in terms of “equal protection”? I don’t actually believe that Congress is intentionally trying to inflict pain on U.S. citizens abroad. I believe that the law of citizenship-based taxation is the result of layer upon layer of laws with unintended consequences. The laws have not been changed because Congress responds only to voters who matter. No Congressman will be elected or defeated because of votes from abroad. Hence, Congressmen don’t care about U.S. citizens abroad. No other governments care about U.S. citizens abroad. (In fact, nobody in the world cares about them.) Furthermore, U.S. citizens are disliked all over the world. It is impossible for them to negate the ubiquitous hostility and hatred for the United States. Therefore, assuming that citizenship-based taxation would be justified as a revenue raising measure, the ASSUMPTION (because Congress has not considered the question) is that all U.S. citizens benefit from government services. Non-U.S. residents do NOT benefit from U.S. government services.